A historic urban ribbon runs through Rotterdam-West, from the Kruisplein to the Marconiplein. 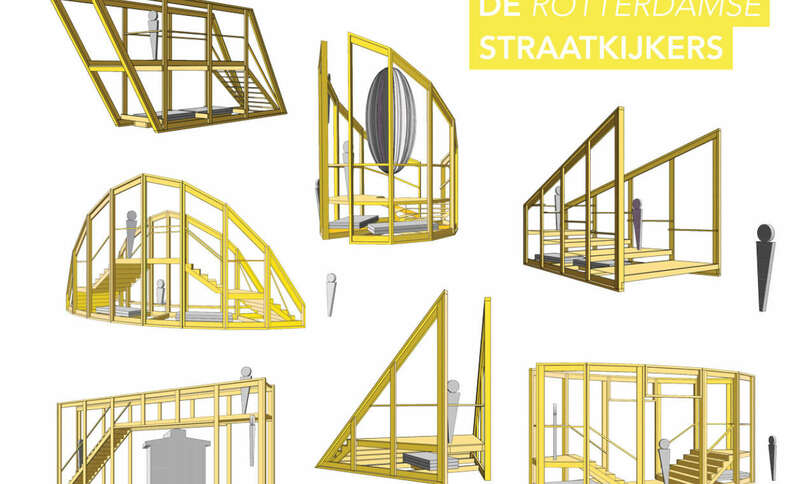 Artist Lieven Poutsma (Observatorium) and architect Bart Lentze (G R I D T) have designed eight Street Viewers for this route, wooden lookouts that always offer a different view of the street. Each structure gives a different view of the busy city street: standing still, just above the ground level, you look at the urban life that takes place there. Looking with wonder at the city where you yourself are part of. The Street Viewers are a series of recognizable works of art that connect different places and streets. On the route of ZigZagCity there are four Street Viewers: Kruisplein, Tiendplein, Middellandplein and Aleidisstraat. You will find information about the area and during the weekends of June 9-10th and 23-24th the Street Viewers are part of various tours, with small performances and activities.